Set the rear ride height of your 05-14 Mustang with UPR Products Adjustable Rear End Spring Mount. These mounts weld to the factory lower spring perch on the rear end and feature a Billet Aluminum adjuster that allows up to 3" of adjustability. Requires the use of coil over springs (included). 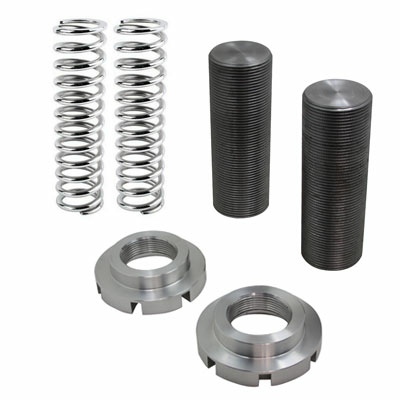 We offer a line of springs to be used anywhere from Street, Road Race and Drag Race applications. Installs in 1 hour or less. Requires welding in the mounting plate. 2005 2006 2007 2008 2009 2010 2011 2012 2013 2014 GT GT500 Boss 302 4.6L 5.0L V8 Mustang Steeda Roush & Saleen Vehicles. No one else can stack up to the bold clean styling of our aftermarket Billet dress ups, Street Strip & Racing Suspension & Performance Parts for your late model American Muscle Car!